Please Note: Those seeking original paintings by Peter Williams should go directly to the Gallery section and visit Peter’s Paintings. If someone were to ask me what area of art I was most passionate about, I might say Marine Art. 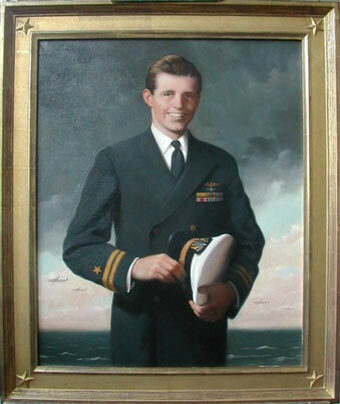 One of the first marine paintings I restored came from a king’s collection (King Olav V of Norway), and I spent time from the early part of my career working for the John F. Kennedy Presidential Library and Museum restoring marine-related objects, which had been given to the late President (see last photo on this page). I have restored the work of the port painters of England’s Liverpool, Canton’s China Trade painters, and New England’s ship portrait painters. 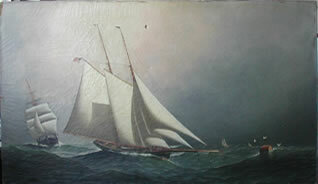 I have restored paintings by James Buttersworth, Antonio Jacobsen, and many others. 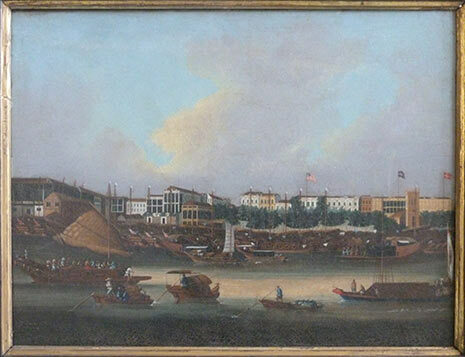 The painting seen above shows the port of Canton (now Guangzhou) as visitors to the port would have seen it in 1857. 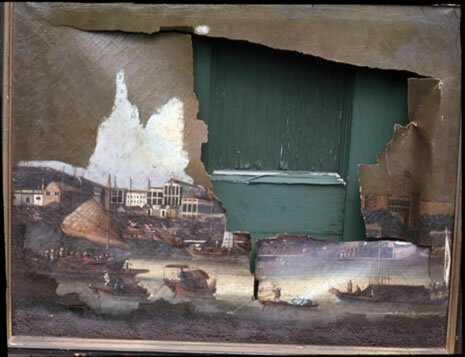 The “before” image shows the torn and darkened painting a few months after it had been discovered in the family attic over 40 years ago. 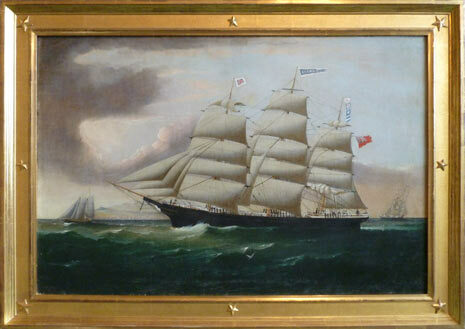 The “after” image shows the painting today after having been cleaned and restored. The cleaning of this painting, sent to us by a California client, required every bit of knowledge and expertise that I had gained over a lifetime. The new frame is an effective replacement since the original frame had been discarded years ago. When I left a museum job to start my own art conservation business, this was the kind of work I dreamed I would be doing. My dream has been realized. 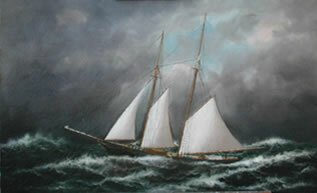 When this painting was featured on the popular Antiques Road Show program on WGBH public television, it was thought by the appraisers to have been executed by James Buttersworth, the accomplished 19th century painter of dramatic yachting scenes. It was appraised on the show for one of the highest prices of any painting that had been seen on the show prior to that time. My reaction after seeing the painting on the screen was that it could not have been painted by James Buttersworth since the water had all the stylistic qualities of an Antonio Jacobson. After the painting was seen on national TV it was possibly the most famous marine painting in America and was later put up for auction in Boston without an attribution. The unsigned painting brought a Buttersworth price and later the buyer asked us to restore the painting. You can see the results above. The Antiques' Road Show painting has been on exhibition at the Peabody Essex Museum for over a year in a gallery designed just for it. On one side of the gallery hang paintings by James Buttersworth, on the other side hang paintings by Antonio Jacobsen. The Road Show painting hangs on the middle wall and visitors can make their own attribution based on comparison of style. Visit the Peabody-Essex Museum in Salem Massachusetts and decide for yourself who painted this dramatic painting. 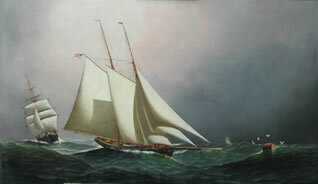 Throughout my professional career, I have enjoyed restoring scores of paintings by the New England marine artist W.P. Stubbs. Although Stubbs was not a sophisticated, highly trained marine painter, his invaluable legacy was to document hundreds of local fishing schooners, lumber, stone and coal carriers and local pilot schooners, all of which have since disappeared from sight. His ship portraits are now regarded as an important part of our American cultural patrimony. 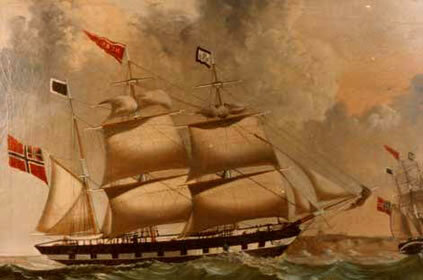 In 1839 the ship Napier , Captain Sanford, of Baltimore Maryland was caught in a terrifying gale in the Irish Sea. 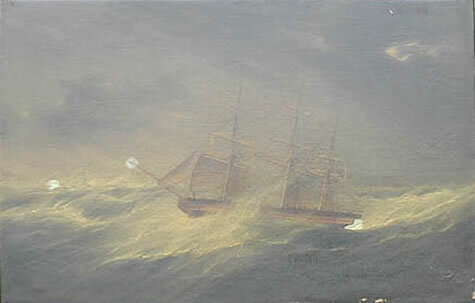 Most of her sails, including her vital topsails, were blown out leaving her with practically no hope of steerage past a coastline strewn with dangerous rocks. As the wind pressed the ship steadily towards the rocks, Captain Sanford used all of his skill and courage to save his ship. The crew prayed for God's mercy, bravely continued to work the ship, and hoped for a miracle. 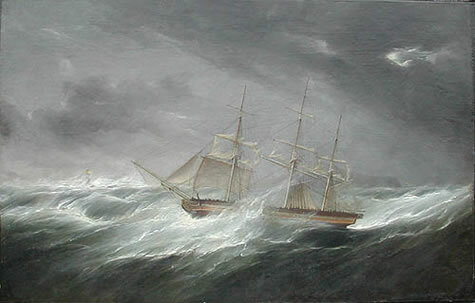 After hours of fighting for their lives in bitter cold, Captain Sanford, his crew and the sturdy Napier made landfall in a protected harbor, having survived the ordeal. (This account is taken from the still existing log book of the Napier written in the hand of Captain Sanford, and the painting and log are still owned by the descendants of the Captain.) 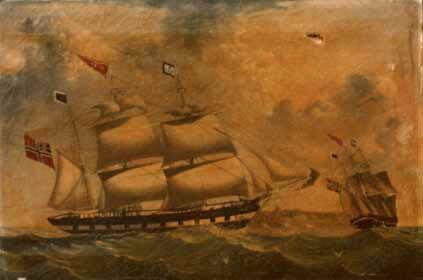 The insurance underwriters for the ship were so grateful to Captain Sanford for saving the ship that they commissioned this painting and presented it to him. 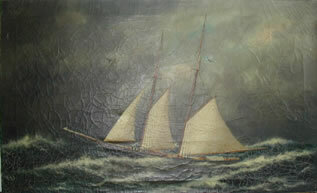 Paintings of sailing vessels from the 17th through the 20th century have been an inspiration to me for nearly my entire life, but one in particular I can never forget. During my first year of business, over 25 years ago, an incredible ship portrait of the bark Hebe arrived for restoration from Vesterheim, the Norwegian-American Museum in Decorah, Iowa. 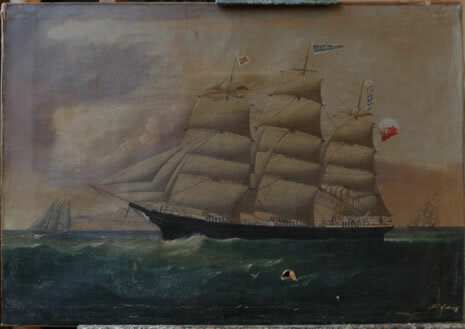 The Hebe had brought Norwegian immigrants to this country in the 19th century, and the painting was given the museum by King Olav V. This maritime painting was the first of a great many which we have restored for our clients. During my first year of business after leaving my job at the Museum of Fine Arts in 1974, I received a call from Dave Powers, who had been the Appointments Secretary at the White House and one of President Kennedy’s most trusted friends. Dave Powers had been appointed to be the first curator of the soon to be built John F. Kennedy Presidential Library and Museum. 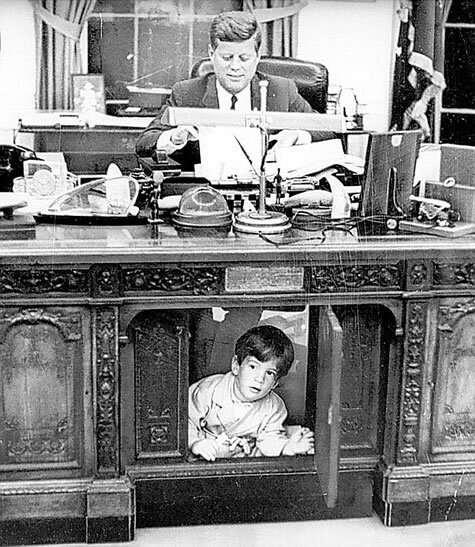 Regretfully, after the President was assassinated many of the items on his desk were removed from his desk in great haste and apparently mishandled. Mr. Powers contracted me to restore the President’s bookends, which had been given to him by one of his surviving crew members aboard PT-109. The bookends were used to hold the President’s personal copies of books he had authored including his copy of Profiles in Courage . The bookends are seen on the far right side of the photograph and are mounted with miniature brass cannon. A scrimshawed whales tooth, which had a broken crown, and the President's desk calendar, which was on his desk the day he died, were also restored. I also replaced a missing base for an inscribed coconut shell which had been cut in half and is seen in the middle of the desk. During World War II, John F. Kennedy was the Commander of a vessel known as PT-109. One night, it was rammed and sunk by a Japanese destroyer. Kennedy and his surviving crew swam three miles to an island which was inhabited by friendly natives. He inscribed his nautical position on the coconut shell which the natives took to a naval base. The information on the coconut shell provided the necessary information to locate and rescue the future president and his crew. A front page article from the Boston Globe dated August 7, 2014 reports the death of Eronie Kumana who discovered Kennedy and his crew alive in the Solomon Islands after the sinking of PT-109 in 1943 during WWII. Eronie Kumana was one of two men who delivered the coconut shell with an inscribed message to the nearest naval base. This heroic act resulted in the rescue of Kennedy and his surviving crew members. 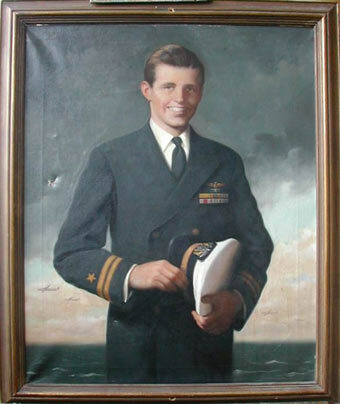 This painting of Joseph Kennedy Jr., brother to our late President John F. Kennedy, required a frame that was worthy of a fallen World War II hero who died too young. The frame that I chose for this painting, after we restored it, reflects his military service and sacrifice as a Navy pilot, and better honors his short life.